This exciting journey takes us to the far north of Japan where we make the most of the winter temperatures, taking an ice-breaker cruise in the Sea of Okhotsk before spending time admiring the incredible snow sculptures at the annual Sapporo Snow Festival. We also explore ultra-modern Tokyo, discover tranquil Zen gardens in ancient Kyoto and visit the snow monkeys at Yudanaka. Our tour starts in Tokyo, the modern day capital of Japan. It is said that over one quarter of Japanese live within a 50 km radius of the centre of Tokyo. The result is a bustling and exciting city, the economic powerhouse of Asia. Our first introduction to this unique culture is when we take a walking tour of the city highlights. We visit the Meiji shrine and Shinjuku area, where the latest electronic gadgets can be seen in neon-fronted shops before making our way to the traditionally styled Hamarikyu gardens. The gardens are located in central Toyko and feature several seawater ponds which change levels as the tides rise and fall. We then board a boat for a short journey along the Sumida-gawa river to the Asakusa Temple, Tokyo's oldest temple. This journey offers a totally different perspective of Tokyo, as we sail past high rise apartments, secluded gardens and busy warehouses. 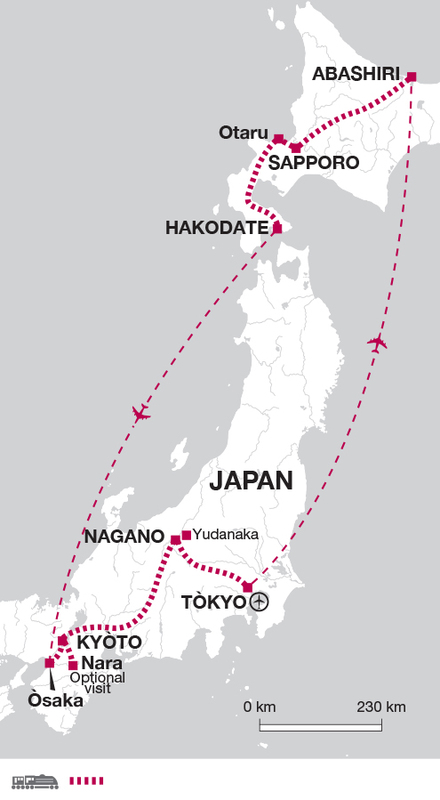 This morning we leave the capital and after a short transfer we take a flight to Abashiri, located on the Okhotsk Coast. The town is most famous for the Kangoku, a prison opened in 1892 with a fearsome reputation for harsh winter conditions. Nowadays the prison has been transformed in to an interesting museum which we will visit, with chance to test out the cells if only for a few minutes. Abashiri is Japan's northern most major city located at 44 degrees north latitude. From mid-January to late March the waters here are covered in drift ice and we will be taking a cruise through the Sea of Okhotsk to get to the main drift ice areas. A variety of wild animals can be seen including seals and sea eagles resting on the ice. From the ship you can sometimes spot fox and deer on the coast. The boat ride takes about one hour in total depending on ice conditions. We take the afternoon train to Sapporo, a scenic route with views across the snow covered landscape. We spend the full day exploring the annual Snow and Ice festival. The festival first began in 1950 but gained worldwide recognition in 1972 when Sapporo hosted the winter Olympic Games. We will see all of the main venues that have snow statues and ice sculptures including Odori Park, Tsudome dome and the main street in Susukino, Sapporo's entertainment quarter. We will also take time to stop at one of the many ice bars that pop up during the festival. In the evening there is an option to visit the Sapporo Brewery for a tour. Today we take the train to Otaru, a small town set along the Otaru Canal. Once a year it is home to the Snow Light Path festival. The snow covered town is decorated with small snow statues decorated with lights, particularly alongside the canal. Often there are also small floating candles in the water. As well as the lanterns there are often food stalls set up alongside the canal so we can sample some local snacks as we make our way through the displays. We return to Sapporo by train in the late evening. Leaving Sapporo we take the train to Hakodate located on the south-west corner of Hokkaido Island. Hakodate was one of the first ports to open to foreign trade and as such has a distinct blend of Japanese and Western architecture. We wander through Motomachi which gives an insight in to how the traders lived and how the cultures merged. In the evening we take a trip to Mount Hakodate for spectacular views down across the city. We rise early this morning to visit the Hakodate morning market. Starting at 6am in the winter the traders sell fresh seafood including crabs (kani) and sea urchins (uni) as well as fresh fruit and vegetables. There are plenty of opportunities to snack as we wander through the stalls. After the market we make our way back to the airport for the short flight to Osaka and then travel on to Kyoto, the old Imperial capital. Kyoto is the cradle of all things uniquely Japanese and the only large city to escape bombing in WWII. It was the Imperial capital for more than 1000 years and was at the heart of the events that shaped Japan's destiny. Signs of the past are visible throughout the city in its grand temples and palaces and also the many traditional shops selling wares that have been produced for centuries. This afternoon we visit the Kiyomizudera Temple and the Gion Geisha district. Kyoto is regarded as the place to see everything you expect to experience in Japan, with more than 2000 temples and shrines, many set in manicured landscaped gardens. But it is also a modern city. We spend a full day exploring including a visit to the temple of the Golden Pavillion, Arashiyama Bamboo grove and the nearby Ryonji temple with its beautiful zen gardens. Today is a free day to explore Kyoto at your leisure. You may wish to take a trip to nearby Nara, home to the Todaji Temple, Big Buddha and the Kasuga Shrine. Your Tour Leader will be on hand to give you tips on where to visit and make the best of your time in this beautiful city. Today we take our first journey on the Shinkansen, Japan's bullet train. Travelling at speeds of up to 300km per hour, with quiet carriages and departures running to a strict timetable this is the ultimate in train travel. We combine this with a slightly slower local train as we make our way to Nagano. After breakfast we pay a visit to the nearby 7th century Zenko-ji temple complex. We can experience the daily workings of temple life, with a chance to watch the monks taking their morning prayers. After a stop for lunch we head to Yudanaka, home to the famous 'snow monkeys'. During the cold winter months these clever simians take to the hot springs to keep warm. There are plenty of onsens (shared baths) which we can try out as well, all monkey free. In the late afternoon we board the Shinkansen and make our way back to Tokyo for our last night in this incredible country. Our tour ends in Tokyo this morning after breakfast. Japan's climate is mostly temperate, with five distinct seasons. Summer is from June to September with temperatures reaching 30°c, although it can vary from warm to very hot. after mid-July. July and August can be humid. Spring and Autumn are mild throughout Japan. Winter, October to April, is cold with snowfall. The main rainy season is June. Japan can be prone to short, tropical cyclones in August to October. October November although cooler is a great time to see the Autumn colours. Rain gear is essential. You will need warm clothing for this trip as both daytime and night time temperatures are cold. Expect it to be around -1 degrees centigrade during the day and sinking to minus 8 during the night. Comfortable walking boots with good grips for walking around the ice festival. There will be plenty of snow so good waterproof footwear is a must. One main piece of baggage and a daypack. We recommend a compact suitcase with wheels or good quality rucksack. While in Japan we will make use of their efficient luggage transfer service to transfer your main bags between Sapporo and Kyoto and from Kyoto to Tokyo. For the nights spent in Hakodate and Nagano you will need to bring overnight items in your daypack as there will be no access to your main bag. Bring a water bottle to save on purchase of plastic bottles and a small torch. Hairdryers are provided at all the hotels. Although entirely voluntary, tipping is a recognised part of life in this region of the world. Some local staff will look to members of the group for personal recognition of particular services provided. Accordingly you should allow £20 for tips. In order to make things easier for you, the Tour Leaders may organise a group's tips kitty and if this is the case, they will account for it throughout the tour. It is preferable to take money in Yen or traveller's cheques. All post offices have international ATMs. Some other ATMs do not accept Western bank/credit cards. Your tour leader will advise you locally. In major restaurants and stores. It should be noted that outside of the major cities it is difficult to change traveller's cheques. Where available it takes 30-45 minutes, the best places to exchange them is at the airport on arrival. Japan: Visas are not required by UK, Australian, New Zealand, US and Canadian citizens. Nothing compulsory. We recommend protection against typhoid, tetanus, infectious hepatitis and polio. The use or possession of Vicks inhalers and some other common prescription and over-the-counter medicines (e.g. for allergies and sinus problems or even certain mild painkillers, such as those containing certain levels of codeine) are banned under Japan's strictly enforced anti-stimulant drugs law. Customs officials may not be sympathetic if you claim ignorance about these medicines. If in any doubt about customs procedures for such items, you should check with the nearest Japanese Embassy before visiting Japan. Please check the latest requirements with your travel clinic or doctor prior to departure. The above is not an exhaustive list. Further information regarding vaccinations and travel health advice can be found by following the NHS and NaTHNaC links at Explore Travel Health and from your local healthcare provider. Visa and vaccination requirements are subject to change and should be confirmed by you before travelling. From food to festivals, scenery to sledding, history to hilltops this is a varied tour where you will be well and truly off the beaten tourist path. This tour is ideal for anyone wanting to learn more about Japanese culture whilst experiencing the unique Sapporo Snow Festival.